After we pulled out of Melbourne Beach on Saturday, we stopped in Summerfield (near Ocala) to see Diana’s brother, our niece, and her children. We also were able to meet our niece’s new boyfriend and his son. Sunday was spent at Carney Island Park on Lake Weir, which was absolutely beautiful! We were so busy talking and watching the kids, we failed to take photos. And get ready for this shocker; I went swimming in an inland body of water in Florida. Never thought I’d ever do that. 😉 Back on the beach, I mentioned to our niece Danielle that I try to incorporate the history of a place we visit when I write about it. We chuckled that even Lake Weir probably had something interesting that had happened there. Well, that turned out to be an understatement! I did a little research after we left. Turns out that in the 1920’s and 30’s…during the Al Capone days in the Midwest…there was a family known as the Barker Gang. They hailed from Missouri, had moved up to St. Paul, Minnesota and proceeded to carry out numerous major crimes. Heading up the family was a tough gal named Ma Barker. J. Edgar Hoover, director of the FBI, described her back then as “the most vicious, dangerous and resourceful criminal brain of the last decade”. When the law started closing in on them, they found their way to Florida and a house on Lake Weir. In correspondence to one of her sons, Ma mentioned a legendary alligator nicknamed Gator Joe that lived in the lake. The FBI found the letter on the son when they arrested him, and soon found Ma’s hideout. They surrounded the house and ordered them to surrender. Turns out that only Ma and another son were there. A four hour long shootout ensued, which resulted in Ma and her boy’s demise. Supposedly the locals showed up to watch the melee, even going as far as having picnics while it happened. And this all took place just up the shore from where Danielle and I wondered about the lake’s history. And..wait a minute. Gator Joe? I was swimming in that water! Monday morning saw us heading for Tallahassee. Our destination for the day was the Tallahassee Automobile and Collectables Museum. This facility, located at the junction of I-10 and US-90, is a member of Harvest Hosts. We got there early enough to visit the museum before their 5 PM closing. There were severe weather warnings for the evening, so we set up before we went inside. 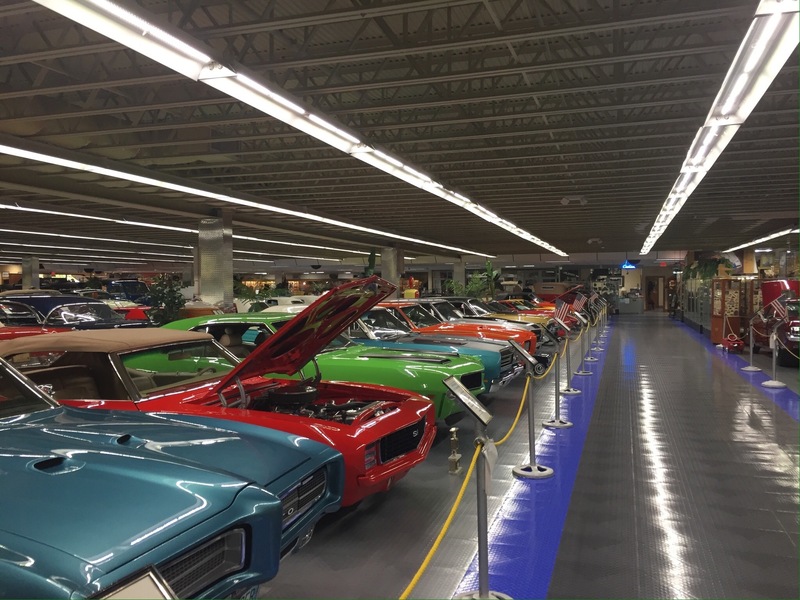 With well over 100 cars, this place was an automotive collector’s dream. That wasn’t all they had. 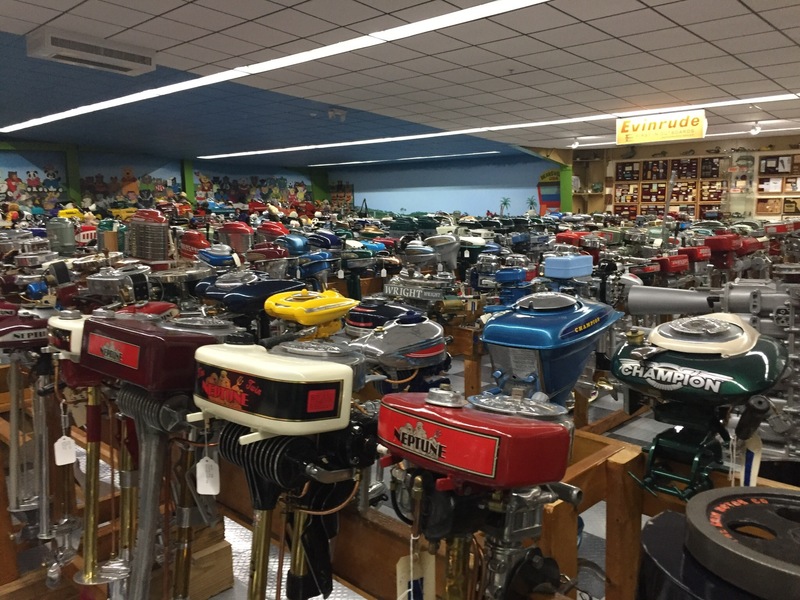 Boat motors, dolls, Steinway pianos, Case knives, brass-blade fans…you name it. 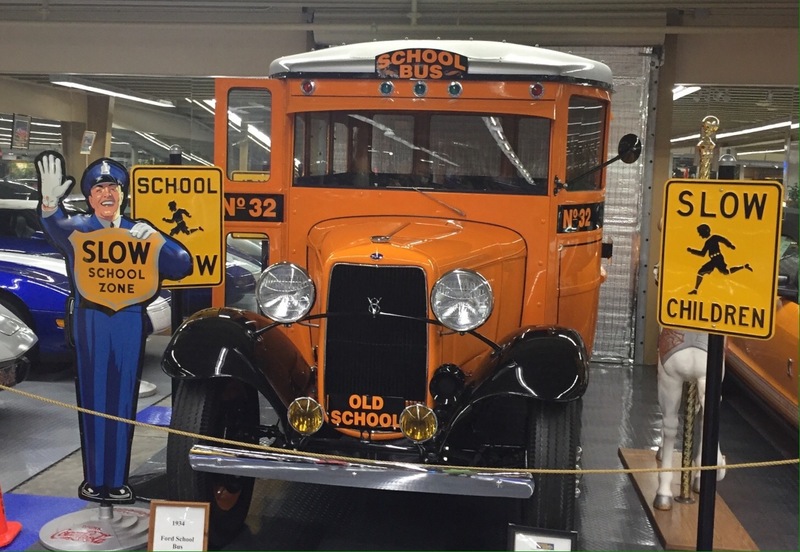 This 1934 Ford school bus was in amazing shape. They even had a Divco milk truck, which I remember from Twin Pines Dairy in Detroit when I was young. It turns out there were only 221 ever built. And remember the Batmobile from the 1960’s Batman TV series? They had that too, along with some of the cars from the newer movies. With that all being said, there were a number of things that bothered me about this museum. I personally thought that even though it had a lot of great items, there was a certain cheesiness to it. Sometimes less is more, if you catch my drift. They also wear their politics on their sleeve, which is evident as soon as you start the tour. No matter what side of the aisle you are on, I’ve never felt it to be a good business practice. There were racially demeaning mannequins, which we found odd. But the biggest turnoff was the KKK display case near the office. It really had no place here. This is obviously one man’s collectibles and not a historical museum, so I question the motive of the display. We will leave it up to you to decide if this is a place that you want to drop $17 ($30 for two). So on to more positive things! The storm ended up being a long, summertime thundershower, complete with plenty of rain and chain lightning. We pulled up our jacks Tuesday morning and headed west from Tallahassee across Florida’s panhandle. 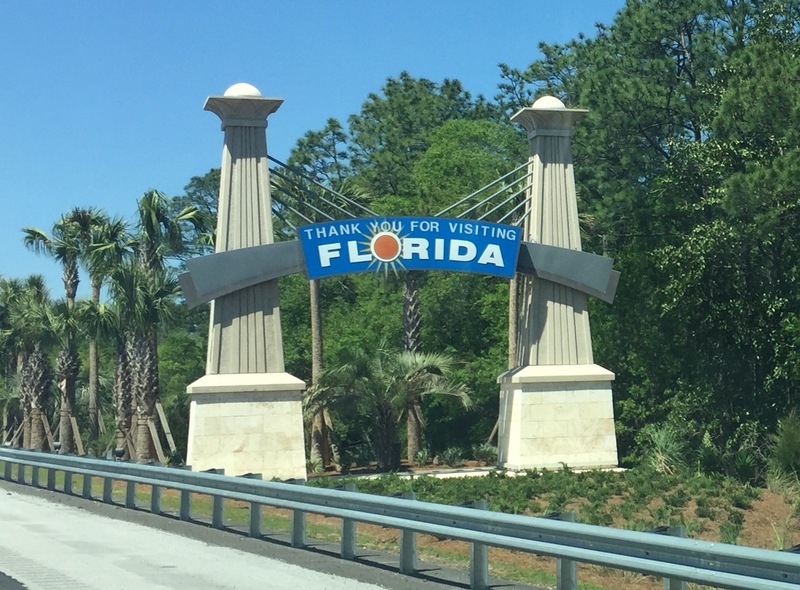 Driving along Interstate 10, we were reminded just how big Florida really is. It took us four hours to reach the western border! When we finally got there, we were greeted with this beautiful sign, which we thought was very nice. We enjoyed our stay in the Sunshine State and we look forward to our return. Next up, a two night stay in Mobile, Alabama. Stay tuned to see what vistas we explore there! I would not like seeing that KKK display either – I cannot understand how that fits in with cars! The rest of it sounds good though! Wishing you continued safe travels! I agree, Kelly. 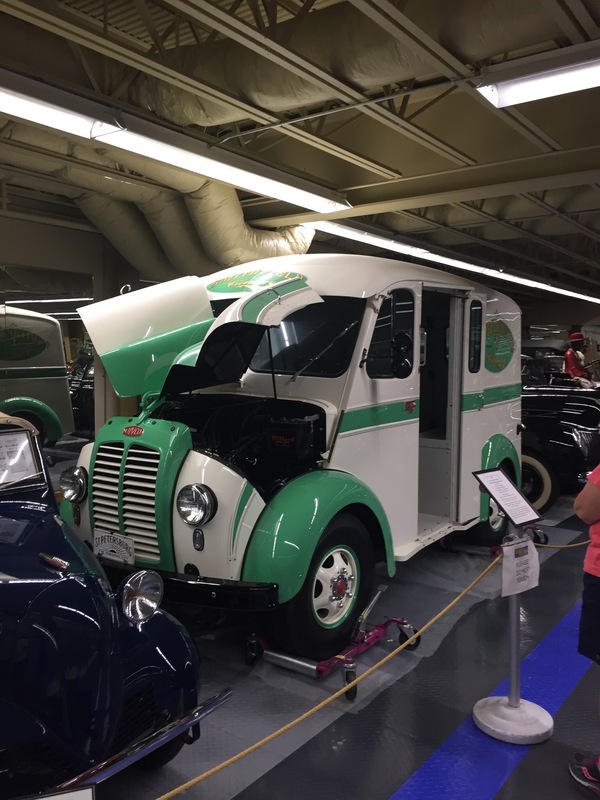 The museum could hold its own with just the vehicles. You are a brave man going swimming in lake water in Florida Jim. I fear the snaky things. I would be screaming at every little piece of water grass that touched my leg. I too love to learn the history of a place visited but could have done without knowing about Gator Joe. 😉 Pricey museum I’ll pass on. Safe travels. Thanks for the bit of Ma Barker history – quite the story!! Love the milk truck, but I’m afraid I would have turned around at the door. Can’t wait to see what you get up to in Mobile!! Thanks, Jodee! That milk truck could be driven standing up or sitting down. We had a milk chute on our house that those guys would put the milk in. What a hoot! Great story about Gator Joe. I enjoyed most of the museum too. 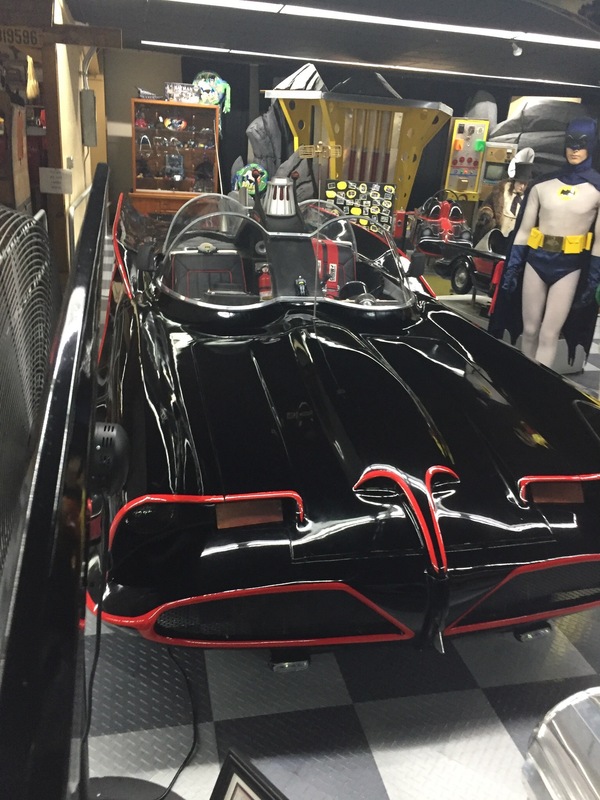 Loved the cars and Batman items. They really did do a great job of keeping those cars clean, Fred. I don’t know why, not being a fisherman, that photo of all the outboard motors made such an impression on me but it did! Yikes. Pretty much every one of those photos had interesting memories attached to the objects. Funny how our brains work that way. It does take a while to get from one end of FL to another. But it’s all part of exploring your vistas, right? Glad to see you’re having a blast. Stay safe. I think I was as astonished by how much everything shone as by the sheer number of motors. Spit polish was never big on my list of joys. But sure makes for a pretty scene. For some reason those motors took me back to a boat ramp on Moose Lake in Wisconsin and a grand parent’s boat and their neighbors and lots and lots of oil drums with outboards sitting in them. Haven’t thought about that in decades. What a great Ma Barker story. You know I love your history lessons 😄 Thanks for sharing about the display and vibe. I totally agree its a car collection. I’m generally not happy when they slip other stuff in. Two exceptions were a period costume display at a car show pairing the outfits with the cars and a football display at the Ronald Reagan library, but again somewhat related because he played football. It’s crazy how every place seems to have a story, Trace. I was driving through Melbourne coming back from the air show and I wpsaw a sign that said ‘birthplace of Jim Morrison’. Sure as all get out, it was. I drove by that spot for two entire winters and never knew it. I think finding out about Gator Joe after the swim was probably a good thing. If you’d known first you might not have been so brave. I love learning the history of the places that we visit. Currently watching the series “Boardwalk Empire” and they are now stretching out into Florida. Thanks for the history lesson! Without a doubt! Thanks for reading, Sharon!